Copyright © 2001 by Praxis International, Inc., All rights reserved. One common denominator of successful people is that they know how to sell themselves. In this brief, to-the-point book, you’ll learn 101 ways to be successful in selling yourself, a product, service, or an idea. The ideas, methods and techniques presented are so easy to apply you can start using them today. And, they’re so effective you’ll want to continue to use them for a lifetime. 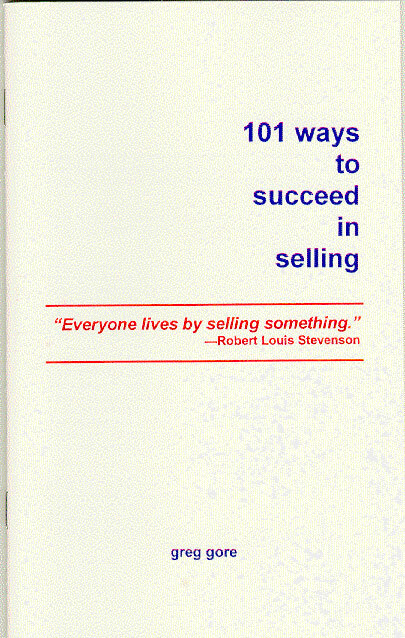 101 Ways to Succeed in Selling is small enough to keep in your briefcase or on your desk. Review the ideas often and apply them at every opportunity. Remember, the ideas will only work when you apply them. In a sales career spanning more than thirty years and fifteen thousand sales calls, Greg Gore has sold a wide range of products and services. After being successful selling household products door-to-door as a college student, he decided to make sales his career. He went on to sell textbooks, technical seminars, and software programming for advanced weapons systems. Along the way, he was national training director for a direct selling company where he trained thousands of sales representatives. Greg Gore has written this book with the hope that others will be able to benefit from the lessons he learned during his career as a sales representative, sales manager, and sales trainer. In short, in 101 Ways to Succeed in Selling, Greg Gore gives you the best of thirty years of sales experience distilled into a small gem of a book.